Choosing a bespoke engagement ring is a more complicated process, but one that is highly rewarding for many couples. A bespoke engagement ring is more than just a customized version of jewelry purchased at a chain store. It’s constructed from start to finish by an artist working closely with the client to produce the ideal tangible symbol of love. Not all jewelers can produce bespoke rings. Chain stores are unlikely to have the specialized equipment needed to create a ring from raw metals and stone. However, full-service chain jewelry stores may be able to direct clients looking for bespoke rings to an artist who can make their vision a reality. Talented jewelers sometimes do repairs for name-brand stores and have a good working relationship with them, so consider finding out more about who is available at a quality chain jewelry shop. Locally-owned jewelry shops are more likely to employ bespoke jewelers than chain stores. Most larger cities have at least one or two local jewelers, many of which feature custom creations. These shops should be high on the list for places to seek the ideal designer. Reputable ones can provide references to other jewelers if there are items that they cannot produce. Another possibility is an internet search for fine jewelers in the local area. Many jewelers do a thriving business outside of a standard brick and mortar location, and finding one nearby is a simpler process now than ever before. Web sites also afford potential clients the opportunity to see a large sample of a designer’s past work. While a beautiful web site is no guarantee of beautiful jewelry, the reverse is often true: a web site with scant pictures and little information about the jeweler’s qualifications is unlikely to be the best choice for a bespoke engagement ring. More distant jewelers may craft exquisite jewelry as well, but require more time and trust than a local jeweler; without regular meetings to assess the progress of the ring, it may be difficult to make sure that a distant designer is creating exactly the right ring. Still, if there is enough time to spend on finding the right jeweler, looking far afield may be the only way to find specialists in more complex techniques such as tension settings and custom-cut stones crafted by expert lapidaries. Regardless of where a reputable jeweler is, one universal constant among them is their willingness to show extensive samples of their past work. If a designer is unwilling to show a sample book or if his or her web site is light on detailed photographs of other designs, it may be time to reconsider and start the search again. As with bespoke jewelry itself, the designers who create it are highly individual. Some prefer to work solely with hand-drawn sketches developed after a series of client meetings while others prefer computer-aided design. Some jewelers are experts in a particular technique or have specialized equipment that allows them to craft unusual or proprietary designs. Expect to meet early and often with a designer. Not only will the designer want to create the perfect design, but he or she will also want to show each step of the ring as it’s being created. Custom ring shapes are usually formed first in wax; the jeweler should meet with and get a client’s approval on the wax form before casting it in metal. Selecting stones, examining the ring after it’s cast but before the stones are set, and looking the finished ring over again before any engraving is done are usually cause for another consultation. Some designers may even craft a finished mock ring in cubic zirconium and silver or gold-tone metal for final approval before costlier materials like diamond and platinum are used. Depending on the method used to cast the ring, it’s appropriate to ask for the wax ring form. If the designer used a lost-wax method of casting, he or she should still have a mold to provide. The finished ring should also include all documentation of metal purity and certifications of the stones in the ring, if any. Diamonds and other precious stones will generally have certification while semi-precious stones may not. While no reputable jeweler will skimp on workmanship or materials, it’s still important to have documentation if the ring is lost or damaged and in need of repairs or replacement gems. Before the initial design meeting, it’s wise to have some ideas in mind that the designer can then refine to create the perfect custom engagement ring. There are few limitations on bespoke engagement rings. In fact, so many possibilities may seem a bit bewildering to contemplate, especially if the ring is to be a custom-crafted surprise. Translating so much emotion into tangible form can be difficult. A good place to start is with some detective work about the jewelry she already wears. If she has a fondness for Art Deco or Victorian styles, this can guide the designer to a style she is sure to find beautiful. If she has a favorite gem or color, incorporate it into the ring. She would probably prefer a ring that flatters jewelry she wears often; a glance in her jewelry box will reveal whether she likes silvery metals or gold tones. She may admire a particular ring style that one of her friends wears–or she could confide that she dislikes a specific type of ring, which is just as useful a piece of information to have. If she wears little or no jewelry, she might be most comfortable with a low-profile design that is easy to wear. Almost anything can be an inspiration for a bespoke ring design. Consider who she is and what makes her unique. Her interests, hobbies, and tastes may provide an excellent starting point. If she has children or a close-knit family, adding their birth stones or engraved initials would be a meaningful addition to the ring. Symbolizing a blended family with a blending of metals in the ring’s band makes a beautiful, yet subtle statement. If she is devoted to a faith or a cause, including a symbol of it in the ring design lends a deeper meaning to an already profound gift. The ring might also address elements of the relationship itself; if it’s endured through difficult times, then choosing a strong, unchanging metal like titanium or platinum gives that sentiment form. The summer beach romance that became something much more might express itself as a cluster of seafoam-hued gems in a setting as fluid as the ocean. Set the same constellation of starry diamonds on her finger that she pointed out in the sky while walking through a park on an evening date. Another possibility is to involve her with designing her ring. While presenting a finished ring is a grand romantic gesture, creating a ring together with the bride-to-be is just as sweetly sentimental. Designers are as happy to work with couples as they are with individuals. The designer may even suggest alternatives–presenting the mock ring, for example, or offering her an engraved invitation to the initial design meeting. Expert jewelers are quite familiar with creative proposals; they have been a part of hundreds of them. The traditional diamond solitaire engagement ring is only one of countless possibilities. While diamonds are the most common engagement ring gem, a bespoke ring could include a myriad of different gems. Not all are equally suitable for engagement jewelry, however. Diamonds are a favored choice due in part to their beauty, but also for their durability. Fragile stones like emeralds, pearls, and opals are beautiful, but may be too delicate for daily wear on the hands unless set in a protective mount such as a bezel setting. Rubies and sapphires of any hue are types of corundum; corundum gems are almost as hardy as diamonds and make excellent choices for jewelry meant to last a lifetime. Bespoke jewelers can add details that are virtually never found in off-the-shelf rings. A custom created ring may have gems not only on the exterior of the ring, but also on the inner surface of the band, a tiny secret that only she will know is there. Multi-metal bands, whether folded together into an organic, rippling mokume gane design or in discrete design elements, are limited only by the metallurgic properties of the materials. Deborah Olague is a great friend who has designed Mokume rings since 2003. She made our wedding bands & she also sells them to many other jewelry retailers who then add significant mark up for people who do not purchase direct from her. Engraving is another way to make a bespoke ring unique; consider exterior engraving using an attractive font as a decorative element rather than the more traditional interior engraving. A designer can also take older jewelry and incorporate the stones into a new ring. Taking a gem from a promise ring and having it set into part of an engagement ring design lends the finished engagement ring a deeper meaning. Jewelers can include metals from older jewelry as well, but usually do so only for sentimental reasons; using new metals from ingots is generally less expensive than the process of melting down old jewelry and re-casting it. The amount of work that crafting fine bespoke jewelry entails can become expensive. 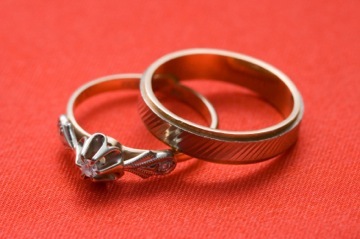 Custom designed engagement rings may cost two to three times as much as a standard ring made from similar materials. However, there are ways to lower that cost without sacrificing the beauty or meaning of the ring. A competent designer will always suggest alternatives if costs seem to be growing beyond a budget. Using stones from older jewelry is one way to make a custom design less expensive, especially if the gems in question are precious ones. Another possibility is using a less expensive type of stone. For example, tanzanite and iolite look almost identical, yet differ vastly in cost despite the less expensive iolite’s greater durability. A designer can also work with the specific properties of a less than perfect stone to enhance its beauty while concealing its flaws; using such a stone could save thousands of dollars yet look as perfect as a flawless one in the proper mounting. The choice of metal also influences price. Platinum is more costly than white gold and vastly more expensive than silver, yet all three metals have a similar finish. Gold’s purity is measured in karats, but 10-karat gold, despite containing less pure gold, is as lustrous as as any purer alloy. Moreover, purer gold alloys are softer, making sturdy 10-karat gold a good choice for a woman who leads an active lifestyle. Less intricate designs generally cost less. Consider ways to streamline the ring without detracting from its beauty or symbolic meaning. Narrowing the band, turning sculptural elements into engraved ones, or fashioning a single elegant rose on the ring rather than an entire bouquet are all ways to lower the price. 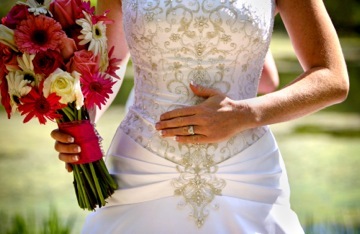 The right jeweler will be glad to help refine a bespoke engagement ring to make it fit both a budget and a bride-to-be.